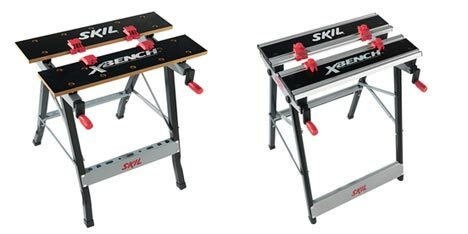 Tool Blog News New Skil XBench Models Less Xtreme? You might remember that back in June I got word that Skil would no longer be selling their XBench in the state of California. This was due to new composite wood regulations pasted in the state that the Xbench did not meet. It was said back in June that new XBench models would be released, but that were not intended to be direct replacements to the original. Because of this, the new models seem to lack some of the key features that made the Xbench, the Xbench. While the Original XBench could be enhanced past just plain old workbench duty with a verity of add-ons and accessories, it appears as though the new models are limited to basic clamping and bench needs. Both models feature a table top that separates and clamps in the middle, the main difference appears to be the weight capacity. Model #3100 is rated at 220 lbs, and uses bench dog holes to hold the clamping blocks. Model # 3115 is rated at 440 lbs, and does away with the bench dogs and instead uses sliding blocks on a t-track.